Ben McAdams talks with a supporter at the Utah Democrats midterm watch party. The moderate Democrat took the stage shortly after 10:30 p.m. at the Radisson Hotel in Salt Lake City to greet supporters, already enthused by a Democratic takeover of the U.S. House. As of 1 a.m., McAdams led 51.3 percent to Love’s 48.6 percent, a difference of about 5,000 as votes trickled in from rural Juab and Sanpete counties, as well as Utah County, where many voters complained of long lines and disorganization. The contest for Utah’s 4th District had been one of the numerous congressional seats Democrats had placed crosshairs on in their bid to retake the U.S. House of Representatives. Democrats handily clinched the goal in the House — if not the Senate — in a blue wave that yielded more than the 23 seats they needed. The race had garnered national attention and attracted nearly $1.5 million in outside spending, mostly from Republicans hoping to retain their majorities. The results look to be a major upset for Love, who was the first black female Republican ever elected to Congress in 2014, and considered a rising star in GOP circles. 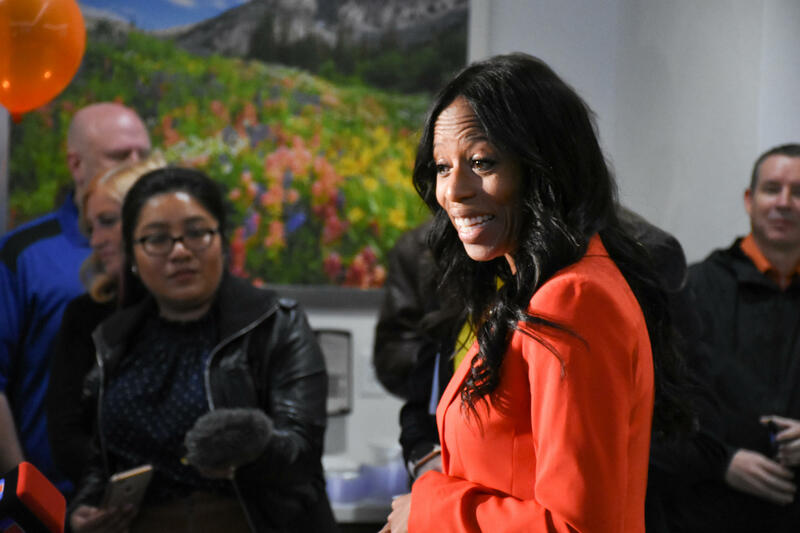 Rep. Mia love held her midterm watch party in Lehi on Tuesday night. Her race against Democratic challenger Ben McAdams was too close to call on Tuesday night. But the two-term Congresswoman struggled to energize Republicans in a district that gave President Trump a meager victory in 2016. And an eleventh-hour controversy over her fundraising during the primary cast a shadow over the campaign that McAdams and outside Democratic groups seized on in critical TV ads. McAdams, in his second term as Salt Lake County Mayor, walked a centrist tightrope throughout his run for Congress, at turns criticizing Love for her fealty to President Trump’s agenda while pledging to work with the president when it made sense. "I will work with the Trump administration when I think it's good for this country, when it's good for Utah," McAdams told NPR. In the weeks leading up to election night, polls showed McAdams closing in on Love, causing several forecasters to move the race into the “toss up” column. As President Trump warned of a caravan of Central American migrants heading for the U.S. border and floated changes to birthright citizenship in his closing message to voters, Love once again rebuked the president in a bid for the district’s moderate voters. But an energized Democratic base, progressive ballot initiatives such as Medicaid expansion and McAdams’ moderate politics secured a commanding lead in the suburban district, particularly in Salt Lake County where he pulled ahead early. At a precinct in Millcreek on Tuesday, unaffiliated voter Becky Metcalf said President Trump’s fear mongering was a key factor in her decision to vote. McAdams eschewed more progressive platforms taking hold on the left, such as abolishing the federal Immigrations and Customs Enforcement agency, and said, if elected, he would not back Nancy Pelosi for another term as Speaker of the House. Touting Utah values, McAdams frequently featured his family of four children in ads and spoke Spanish at campaign stops. He also hammered his bipartisan work on homelessness and the opioid crisis with Republican leadership in the state. The 4th District, which includes the suburban pockets of Salt Lake and Utah counties along with two rural counties, Juab and Sanpete, leans Republican. Voters there had last elected a Democrat, former Rep. Jim Matheson, in 2012. In an interview with reporters before heading home for the night, McAdams said with Democrats controlling the House and Republicans the Senate, he hoped more could be accomplished. “I’ve always felt we needed a Congress that works in a bipartisan fashion — with Republicans working with Democrats, and Democrats working with Republicans. As a Democrat in Utah, that’s the only system I’ve known,” he said. When Utah’s polls close next Tuesday at 8 p.m., all eyes will be on the state’s elections website for early results in the hotly contested 4th Congressional District.